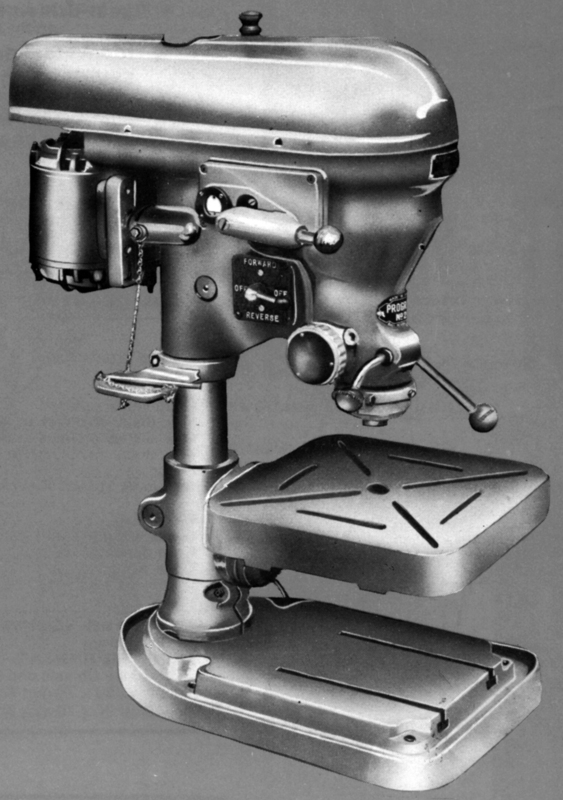 From the 1940s until the 1970s, Elliott offered a range of drilling machines branded as "Progress". They varied from lightweight types listed as the "Junior"; the early Mk. 1 light-duty No. 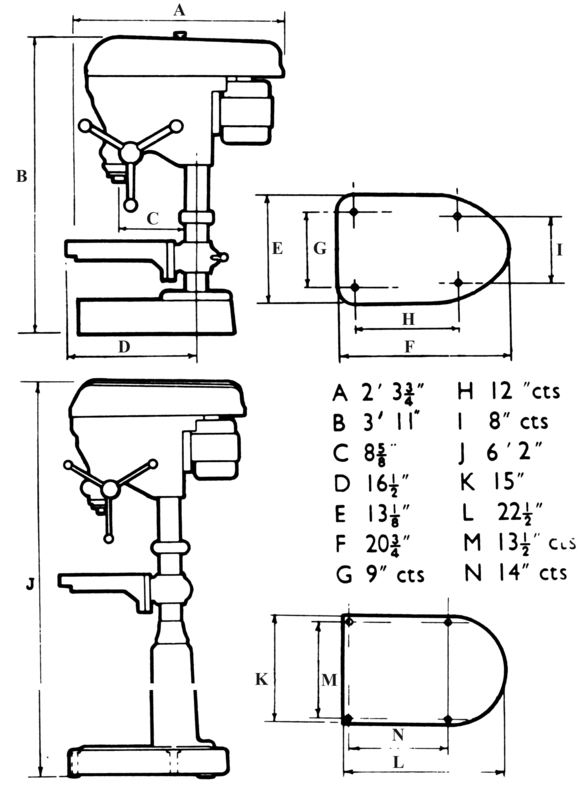 1 Morse taper Models "1" and "1S" together with later and heaver Mk. 2 versions; the rather over-stylised 1/2-inch 16 and 16S; the very efficient, strong and popular "backgeared 2G and 2GS (both covered lower down on the page); the heavy but conventional No. 3A Pillar and a set of industrial-class geared-head types that went through several evolutionary stages, the 3E, 4E and 5E. All versions of the Progress had a 13" x 13" table, deeply ribbed on its underside and equipped with radial and parallel slots. Able to be inclined through 90° each side of horizontal, the alignment could be set back to level by the use of a pin that passed through the mating surfaces. On the bench model the heavy foot was machined with two T-slots, while that on the pillar model, with its much deeper section, had four slots each with a hole at one end through which the head of a clamping bolt could be inserted. 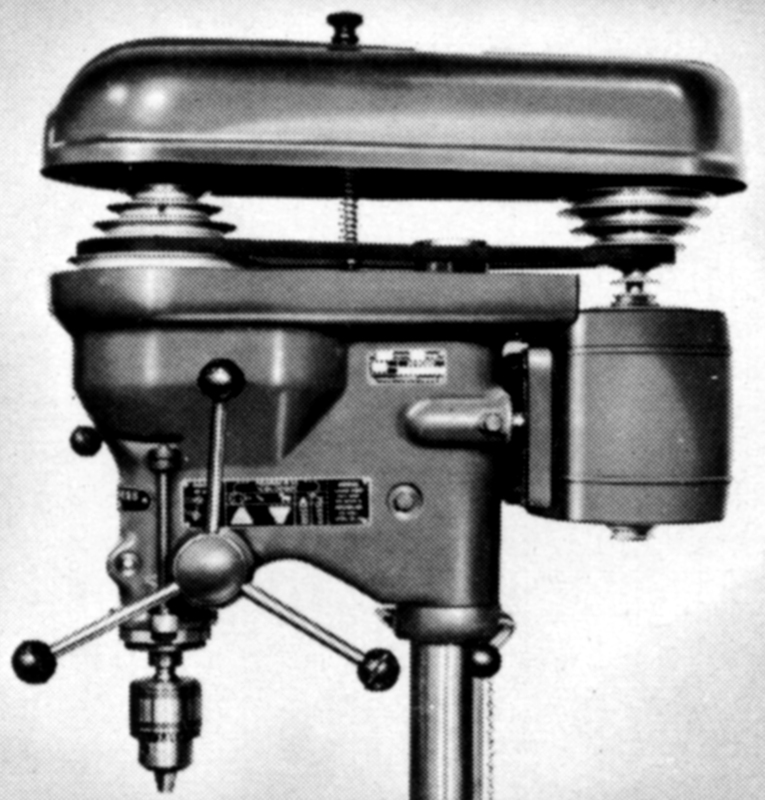 Running in relatively large ball thrust races, the spindle had a travel of 4 inches, (200 mm), a slot to knock out taper drills, a maximum clearance between the spindle nose and table of 12.75" - this improving to 23" from the nose to the top surface of the base. Motor fitted varied, but the one fitted are generally found to be either a 0.5 h.p. 1425 r.p.m. 3-phase or a 3/4 h.p. 1-phase - though the odd one with a 2-speed 3-phase motor has been found. The switch fitted to the left-hand side of the head was always a reversing type - allowing the drill to be used (carefully) for tapping work. Standing 47 inches high (1194 mm) the bench 2G weighed around 392 lbs (178 kg) and the 74-inch high (1880 mm) 2GS pillar version 560 lbs (255 kg). All versions of the Progress 2G and 2GS are sought-after models; well-constructed and having an excellent specification, they take up little room yet are capable of tackling most drilling jobs likely to be encountered by the smaller workshop. 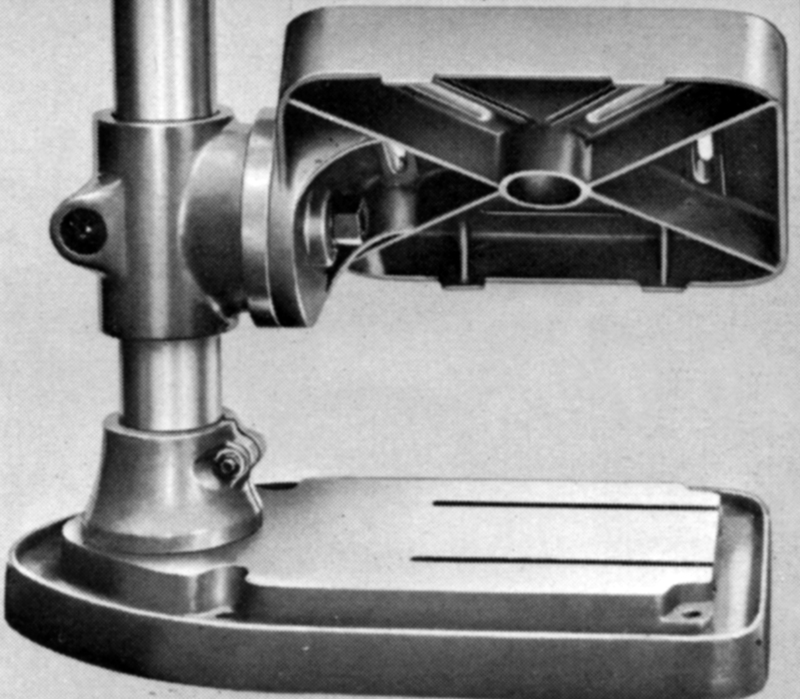 Below the 2G drills in the Progress and Elliot lines were the lightweight "Junior" models, current during the 1950s and 1960s; early and late versions of the direct V-belt drive No. 1 and 1S and the Model 70, introduced in the late 1960s. 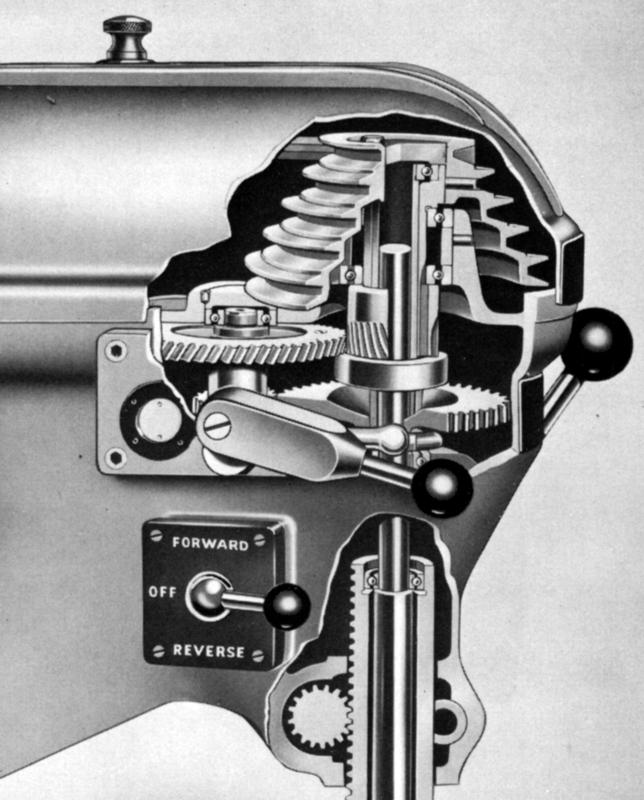 Above the 2G was the 3A Pillar, an all-belt-drive model with a No. 3 Morse taper spindle. 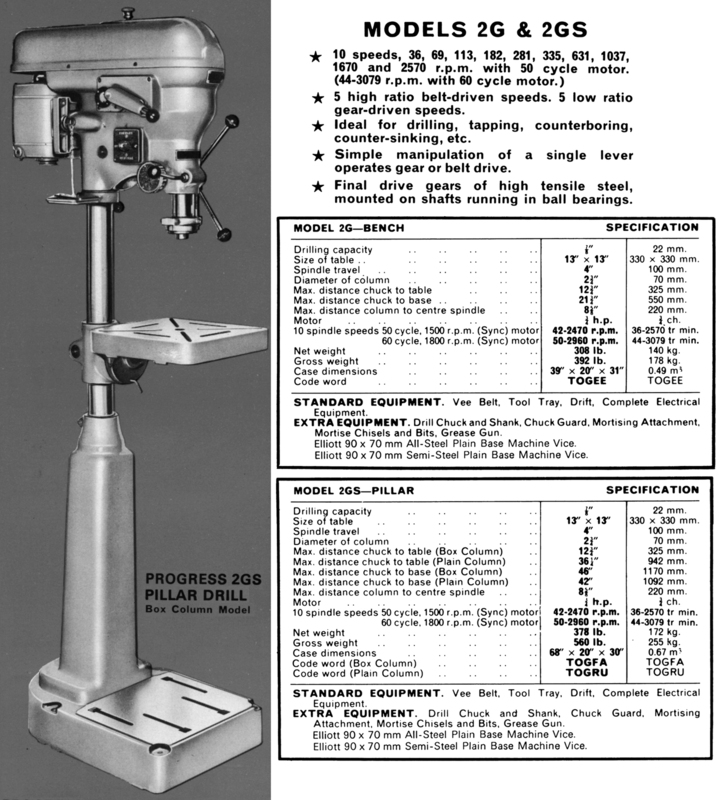 For a high-quality, heavily-built, versatile yet compact drill with a wide speed range and torque-enhancing reduction gearing within the head the choice is simple, one of the following: the superb Meddings Pacera MB and MF models and the equally useful Fobco 7/8 and 10/8, Boxford PD8, Progress 2G and 2GS and late models of the Kerry Drillmaster 3/4". Also in contention would be the rarely-found 10-speed Startrite Mercury and Speedway Models with their epicyclic gearbox mounted around the spindle nose. All makes and models were available in both bench and pillar types with some of the latter having more strongly constructed "box column" supports in cast iron.